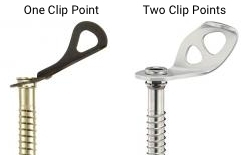 Bonus: Since the ice screw length is part of the model name, you can search just a number to find all the screws of a certain length..
Short screws (“shorties” or “stubbies”) are for thin ice found on harder ice climbs and/or in crappy conditions. With ideal conditions climbers will be able to plug medium-sized screws with no problem. They have a nice weight to length balance. Long screws are most often used as anchors or in crappy ice conditions where they can go deep to find the real ice below. Mountaineers may also prefer long screws as they can gain better purchase in less than ideal ice and have less chance of melting out. There is no standard of how many screws to carry of each size. It will vary depending on where you’re climbing, your style of climbing and what level you’re climbing at. 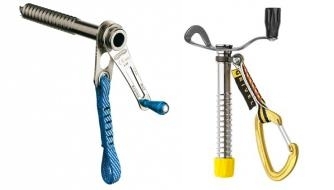 Some climbers will get a variety of the sizes, while others might get a majority of medium screws, a few shorties for thin spots and some long screws for anchors and bomber placements. Note: The amount of threading on each screw does not change even when the overall length changes (exception: e-climbs screws). Note: This is not currently a feature to filter on (coming soon), but is important to see the difference. Pros: There is an extra “handle” or “knob” for faster screw threading. Cheaper than folding versions. Cons: Some of the knobs stick out substantially and could cause the rope or draws to get caught on the lengthened handle. 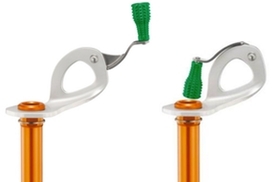 Pros: Foldable handle allows for quick threading and reduces snagging potential by folding out of the way. Nearly 70% of the screws are color-coded, and this represents nearly all of the screws that have handles/knobs (color coding can also be on the hanger or the tube itself). Pros: Like on cams, color-coding makes for faster size identification. There are 7 brands that follow red, yellow, blue, gray, green as a small to large standard, but that is not consistent across the industry. Pro: You don’t have to carry quickdraws, so it saves weight and speed of clipping. Pro: More clipping options, especially ones that are closer to the ice to reduce leverage in a fall situation. Con: This comes standard on only a few screws so your options are limited. On some configurations this will also make the hanger much larger. This is the most controversial feature. Grivel and CAMP (which make up 30% of the ice screw market) use reverse threading on all of their screws and claim that this angle is more effective at spreading an impact load across ice. If you are interested in the merits of the “reverse thread” design, click to see photos of the concrete tests (reverse threading pulls out more concrete than standard threading) and read about the concerns of testing in concrete. Read discussion of the engineering that goes into thread design and the questioning of straight pulls while testing to judge if reverse threading would make a [significant] difference in the event of a fall on ice. Nearly 90% of ice screws are made from steel because steel is stronger and more durable. 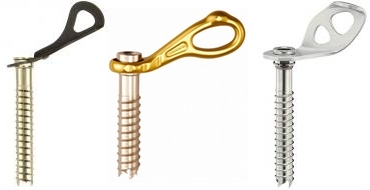 Steel is the “workhorse” material while aluminum screws are designed for “fast and light” ascents. 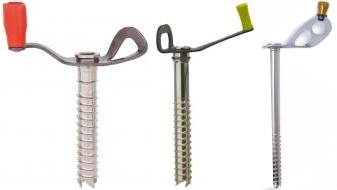 Aluminum screws will dull and wear out much faster and are not designed for crag-style ice climbing. If a brand is missing from this list (like Climbing Technology, Kailas, Ice Rock, Salewa, Singing Rock and Stubai), scroll to the bottom of this page to see all the unfilterable gear we track, and ideally it'll be there.